A laptop is riddled with compromises, compared to its desktop cousin. Really, the only additional ability it has to have over a desktop is to be mobile, but that raises all kinds of problems. A desktop PC can weigh upwards of 20KG (and would never fit in your rucksack). A laptop should weigh far less at about 3KG and ideally be half of that again. Desktop PCs can also have 1KW power supplies if they're real monsters, but we want our laptops to sip gently from a 3-cell battery all day long. The amazing thing is, that many of today's laptops do all that just fine. They're fun to use too, even though further shortcomings remain left unchecked. Just pay some attention to your back and shoulders after an 8 hour stint using one if you're wondering what those other compromises are. I suspect the trickiest design challenge was to shrink the keyboard and mouse. The oldest laptop in my collection has a fine keyboard, so I think that must have been nailed early - however this Brother took quite a strange approach to the mouse, putting a trackball in the corner. It actually works okay, although being left handed, I would most definitely have gotten annoyed with it and opted for putting a mouse in my bag. In fact, it's much the same with my lovely modern laptops too. In spite of the progress made with trackpads, I still prefer a mouse. A trackpad is a smooth touch-sensitive surface, that will often not only allow you to drive the mouse cursor around, it will also recognise gestures. They're great for navigating menus and surfing the internet, but still not as good as a mouse for finer detail, like photo editing, or gaming - for that, there is still no substitute for a mouse. So, if portability remains at the forefront of your computing desires, but the trackpad falls short, what mouse should accompany your laptop? Well, after much reading around, I went for the Microsoft Arc Bluetooth Mouse. It's portability credentials are immediately obvious. When you're not using it, it can be folded flat! It's also very light indeed. The act of folding it open switches it on and it will then automatically connect to any available paired laptop. Pairing is simple if you've ever used a bluetooth device, this is much the same - but be sure to check your device supports bluetooth v4. If it's too old, your arc mouse won't play I'm afraid. Bluetooth v4 is designed to be really energy efficient, so you can expect months of intermittent use out of the two AAA batteries it holds in the (not very) thick end. The mouse itself is in quite an austere looking grey, but it's smarter in life than in pictures. There’s the usual left and right mouse buttons and in the middle, but then a 'touch' based scroll-wheel. Running your finger up and down the mid-section will scroll your screen as a traditional mouse wheel would - feedback is both via a sound effect and some gentle haptic feedback (vibration). It works well and is a great way of removing the bulk of a mechanical mouse wheel. The rest of the arc mouse is covered in a stretchy plastic to deal with the constant bending it will be put through. I originally wondered if it might be at risk of splitting, but after 3 months of use, there's still no sign of wear. Finally, the blue eye of the mouse is very impressive. This is what tracks your movements. Microsoft claim it will remain accurate on any surface and I've yet to find anything to challenge it. I've had problems with mice on my white desk in the past, but the Arc doesn't miss a thing. Whilst the Microsoft Arc is not the most ergonomic mouse in the world, it's as ergonomic as your laptop. Just like I'm not sure it's healthy to hunch over a laptop all day every day, I would only recommend the Arc as a travel companion. If you never leave the desk, get something bigger and uglier, but more comfortable. 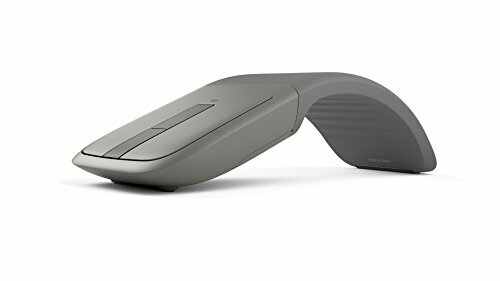 Otherwise, the Microsoft Arc Bluetooth Mouse gets the Dependent on Gadgets seal of approval. What do you think? Is there a better mobile mouse than the Arc? Ever found a surface your Arc won't work on? Let me know in the comments.